Electronic Kit School. - In propagation of signal we knw there three kinds of mmodulation there are amplitude modulation, frequency modulation, and pulse modulation. One of the modulation mentioned is amplitude modulation or AM that the amplitude of signal be modulated and change in ever time. There are electronic design circuit to build AM modulator simply and also complex to give est result for user. One of the AM modulator circuit is look like in Figure 1 below with the main component used is 741 IC that also called with Op-Amp integrated circuit that also popular today. The main component to modulated the AM in this circuit one again is 741 IC which popular today. In this time, beside we will show you the circuit, here we also will show you component part and global description about this circuit. Circuit like in Figure 1 above show you about the AM modulator using the main component 741 IC. From Engineersgarage site describe that the AM demodulation is done using a low pass filter which can filter out the high frequency carrier from the AM wave in such a way that only the envelope of the carrier wave appears at the output of the filter. The amplitude of the filtered wave has variations corresponding to the amplitude of the modulating low frequency signal. 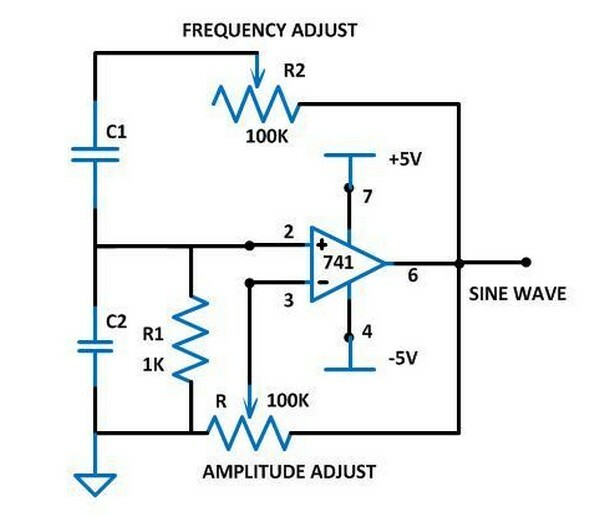 To get a better filtering using the Low pass filter the carrier frequency must be as large as possible and hence the carrier frequency generator circuit explained in the article AM modulation has to be modified for a very high frequency carrier signal. The only change that is required is the value of the capacitors C1 and C2 which determines the carrier frequency generation. The value of R1 is kept the same as 1K but the value of the resistance R2 can be varied. As the value of the R2 decreases the output frequency of the circuit increases. As it is mentioned in the article AM modulation that the minimum value of the R2 which produces the highest stable frequency is around 130 ohms. In this project to increase the carrier frequency at least 10 times that achieved in the previous project the value of C1 and C2 is reduced to 10 times than that used in the previous AM modulation project.